Work began on the Morwell Open Cut in April 1949. Due to Government funding cutbacks in the early 1950's, all work on the "Morwell Project" ceased. The entire project was put into "mothballs" awaiting a more favourable economic environment. Construction works resumed in 1954. 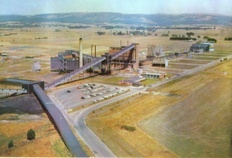 The first generating unit at Morwell Power Station went into service in November 1958. The first power produced for the "system" occurred on 7th December 1958. A briquette production test run took place on 9th September 1959. The first commercial production occurred on 8th December 1959. The Morwell Gas Plant which cost 10 million to construct was officially opened by the Duke of Edinburgh at 12.35pm on Monday 5th December 1956. During the official proceedings the Duke stated that " This is a memorable day and I am sure that gas engineers all over the world will join me in wishing this development and all who are responsible for it every success". 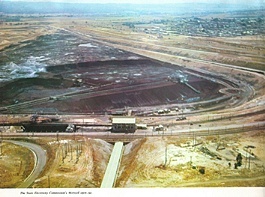 The facility was located on Morwell's eastern outskirts and ceased production in November 1969 due to natural gas discoveries in Bass Strait.